The claims made in a book from the biotechnology industry are laughable. But these blatant lies are passed off as 'science' for schoolchildren. March 20, 2012 | It's not enough that the biotech industry -- led by multinational corporations such as Monsanto, Dow, Syngenta, BAS, and Dupont -- is poisoning our food and our planet. It's also poisoning young minds. In a blatant attempt at brainwashing, the Council for Biotechnology Information (CBI) has widely circulated what it calls a Biotechnology Basics Activity Book for kids, to be used by "Agriculture and Science Teachers." The book -- called Look Closer at Biotechnology -- looks like a science workbook, but reads more like a fairy tale. Available on the council's Web site, its colorful pages are full of friendly cartoon faces, puzzles, helpful hints for teachers -- and a heavy dose of outright lies about the likely effects of genetic engineering on health, the environment, world hunger and the future of farming. CBI's lies are designed specifically for children, and intended for use in classrooms. At a critical time in history when our planet is veering toward a meltdown, when our youth are suffering the health consequences (obesity, diabetes, allergies) of Big Ag and Food Inc.'s over-processed, fat-and sugar-laden, chemical-, and GMO-tainted foods, a time when we should be educating tomorrow's adults about how to reverse climate change, how to create sustainable farming communities, how to promote better nutrition, the biotech industry's propagandists are infiltrating classrooms with misinformation in the guise of "educational" materials. Brainwashing children. It's a new low, even for Monsanto. Hi Kids! Welcome to the Biotechnology Basics Activity Book. This is an activity book for young people like you about biotechnology -- a really neat topic. Why is it such a neat topic? Because biotechnology is helping to improve the health of the Earth and the people who call it home. In this book, you will take a closer look at biotechnology. You will see that biotechnology is being used to figure out how to: 1) grow more food; 2) help the environment; and 3) grow more nutritious food that improves our health. As you work through the puzzles in this book, you will learn more about biotechnology and all of the wonderful ways it can help people live better lives in a healthier world. Have fun! Before we take a closer look at the lies laid out in Look Closer at Biotechnology -- lies that are repeated over and over again, the better to imprint them on young minds -- let's take a closer look at the book's publisher. The Council for Biotechnology Information describes itself as "a non-profit 501(c)(6) organization that communicates science-based information about the benefits and safety of agricultural biotechnology and its contributions to sustainable development." The bottom line is that CBI exists to advance the interests of the corporations that it was formed to promote -- in this case, the biotech industry. While it purports to communicate "science-based information," in fact, that's not its mission at all. Its mission is to maximize the profits of Monsanto and the biotech industry. Not surprisingly, CBI is funded largely by the biotech, chemical, pesticide, and seed industry giants: BASF, Bayer CropScience, Dow Agro Sciences, Dupont, Monsanto, and Syngenta. There's nothing new about corporations lying to the public. Corporations routinely lie to their employees. They lie in advertising. They lie in the lopsided so-called studies and research projects that they self-fund in order to guarantee the outcomes that support their often false, but self-serving premises. They buy off politicians, regulatory officials, scientists, and the media. Although here we're focusing on the biotech industry trying to brainwash our kids, CBI certainly does not limit its propaganda to just children. CBI recently contributed $375,000 to the Coalition Against the Costly Labeling Law -- a Sacramento-based industry front group working to defeat the California Right to Know Genetically Engineered Food Act of 2012. If passed in November, this citizens' ballot Initiative will require food manufacturers and retailers to label foods containing genetically engineered ingredients, as well as ban the routine industry practice of labeling or advertising GE-tainted foods as "natural" or "all natural." CBI, the Farm Bureau, and the Grocery Manufacturers Association are campaigning furiously to preserve their "right" to keep consumers in the dark about whether their food has been genetically engineered or not, and to preserve their "right" to mislabel gene-altered foods as "natural." Clearly, the Council for Biotechnology Information has little or no regard for "science-based" information. But lies aimed directly at kids -- under the guise of science education? In our schools? Let's take a closer look at the claims made in Look Closer at Biotechnology. In 2009, in the wake of similar studies, the Union of Concerned Scientists examined the data on genetically engineered crops, including USDA statistics. Their report -- Failure to Yield -- was the first major effort to evaluate in detail the overall yields of GE crops after more than 20 years of research and 13 years of commercialization in the United States. According to the definitive UCS study, "GE has done little to increase overall crop yields." A number of studies indicate in fact that GE soybeans, for example, actually produce lower yields than non-genetically engineered varieties. Contrary to the claim of feeding the world, genetic engineering has not increased the yield of a single crop. Navdanya's research in India has shown that contrary to Monsanto's claim of Bt cotton yield of 1500 kg per acre, the reality is that the yield is an average of 400-500 kg per acre. Although Monsanto's Indian advertising campaign reports a 50-percent increase in yields for its Bollgard cotton, a survey conducted by the Research Foundation for Science, Technology and Ecology found that the yields in all trial plots were lower than what the company promised. (Page 11). The claim that GE crops increase agricultural yields is a blatant lie. Equally untrue is the industry's claim that it is motivated by the desire to feed the hungry of the world. As the Union of Concerned Scientists points out: "For the most part, genetic engineering techniques are being applied to crops important to the industrialized world, not crops on which the world's hungry depend." Where does all the genetically engineered soy and corn -- two of the largest GE crops -- end up? In animal feed, processed junk foods -- and school lunchrooms. Precious little goes to feed the hungry in impoverished regions. One of the sub-arguments related to increasing yields is the biotech industry's claim that GMO crops are more resistant to pests -- hence more of the crops survive. In Look Closer at Biotechnology kids are told that agricultural biotechnology is a "precise way to make seeds with special qualities. These seeds will allow farmers to grow plants that are . . . more resistant to pests . . ." In fact widespread commercialization of herbicide-resistant and Bt-spliced GE crops has engendered a growing army of superweeds and superpests, oblivious to all but the most powerful and toxic pesticides. What we should be teaching kids in science class is what scientists have been warning for years -- that any attempt to increase resistance to pests through genetic engineering will ultimately fail. Insects -- and diseases -- will build up a tolerance over time, and evolve into stronger and stronger strains. That's how nature works -- and even Monsanto can't fool Mother Nature. Organic agriculture, on the other hand, utilizing crop rotation, biodiversity, natural fertilizers, and beneficial insects, reduces crop loss from pests and weeds, without the collateral damage of toxic pesticides and fertilizers. Recently, 22 leading scientists told the US Environmental Protection Agency that it should act with "a sense of urgency" to urge farmers to stop planting Monsanto's genetically engineered Bt corn because it will no longer protect them from the corn rootworm. 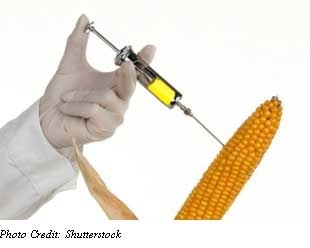 Bt corn is genetically engineered with bacterial DNA that produces an insecticide in every cell of the plant, aimed at preventing corn rootworm. Except that corn rootworms have now developed resistance to these GE mutants. Just as scientists had predicted years ago, a new generation of insect larvae has evolved, and is eating away at the roots of Monsanto's Bt corn -- a crop farmers paid a high price for on Monsanto's promise that they would never have to worry about corn rootworm again. Scientists are now warning of massive yield loss and surging corn costs if the EPA doesn't act quickly to drastically reduce Bt crops' acreage and ensure that Monsanto makes non-GMO varieties of corn available to farmers. "Massive yield loss" doesn't sound like "more food" -- whether you're 12 years old or 112. Eco-farming projects in 57 nations showed average crop yield gains of 80 percent by tapping natural methods for enhancing soil and protecting against pests. Projects in 20 African countries resulted in a doubling of crop yields within three to 10 years. Sound ecological farming can significantly boost production and in the long term be more effective than conventional farming. Two lies for the price of one. Biotechnology -- specifically genetic engineering -- helps neither farmers nor the environment, according to the majority of legitimate scientists and economists. In fact, the opposite is true. Genetic engineering of seeds has wreaked havoc on the environment and brought misery to hundreds of thousands of small farmers all over the world. The majority of farmers in developing countries struggle to afford even the most basic requirements of seeds and fertilizers. Their survival depends on the age-old practice of selecting, saving and sharing seeds from one year to the next. When multinational corporations move into areas previously dominated by small farmers, they force those farmers to buy their patented seeds and fertilizers -- under pretense of higher yields, and under threats of lawsuits if they save or share the seeds. Every year, they're forced to buy more seeds and more chemicals from corporations -- and when the promises of higher yields and higher incomes prove empty, farmers go bankrupt. Compounding their corporate crimes, when Monsanto's patented seeds contaminate the non-GMO crops of small farmers (because the seeds drift across property lines) Monsanto routinely sues farmers for growing their patented seeds illegally, even though the seeds were actually unwanted trespassers. Further, the company has ruined the livelihoods of small farmers by harassing them for illegally growing patented seeds, even in cases where no patented seeds have been grown, either knowingly or by accident. As Monsanto and others have expanded worldwide, into India, China, Pakistan, and other countries, the effect on small farmers has been devastating. In India, for instance, after World Trade Organization policies forced the country in 1998 to open its seed sector to companies like Cargill, Monsanto and Syngenta, farmers quickly found themselves in debt to the biotech companies that forced them to buy corporate seeds and fertilizers and pesticides, destroying local economies. Hundreds of thousands of India's cotton farmers have committed suicide. And according to a Greenpeace report, poorer farmers in the Philippines were sold Monsanto's Bt corn as a "practical and ecologically sustainable solution for poor corn farmers everywhere to increase their yields" only to find the opposite was true: Bt corn did not control pests and was "not ecologically sustainable." Which brings us to one more of the Council for Biotechnology Information's lies to kids: That agricultural biotechnology is good for the environment. Study after study, over more than a decade, has warned us of just the opposite. Even the pro-biotech USDA has admitted that GE crops use more pesticides, not less than non-GE varieties. Genetic engineering results in evermore pesticides being dumped into the environment, destroying soil and water, human and animal health, and threatening the biodiversity of the planet. How about telling kids instead that numerous reports, including one from the German Beekeepers Association, have linked genetically engineered Bt corn to the widespread disappearance of bees, or what is now referred to as Colony Collapse Disorder? And while we're at it, maybe we should remind kids of the Albert Einstein's quote: "If the bee disappeared off the surface of the globe then man would only have four years of life left. No more bees, no more pollination, no more plants, no more animals, no more man." Maybe we should also tell them that glyphosate, the active ingredient in Monsanto's herbicide, Roundup, the most widely used herbicide in the world, kills Monarch butterflies, fish, and frogs, destroys soil fertility, and pollutes our waterways and drinking water. The fact is, widespread use of Monsanto's Roundup in all agricultural and urban areas of the United States is destroying the environment, pure and simple. US Geological Survey studies released this month show that Roundup is now commonly found in rain and rivers in agricultural areas in the Mississippi River watershed, where most applications are for weed control on GE corn, soybeans and cotton. Here's the real truth, from an article published this past week: Monsanto's Roundup is actually threatening the crop-yielding potential of the entire biosphere. According to the article, new research published in the journal Current Microbiology highlights the extent to which "glyphosate is altering, and in some cases destroying, the very microorganisms upon which the health of the soil, and -- amazingly -- the benefits of raw and fermented foods as a whole, depend." This is the perhaps the most outrageous lie of all. Telling kids that GE foods are more nutritious is tantamount to telling them Hostess cupcakes and Coca-Cola are health foods. Genetic engineering -- of human food and food for animals that humans eat -- has been linked to a host of diseases and health issues, including auto-immune disorders, liver and kidney damage, nutritional deficiencies, allergies, accelerated aging, infertility, and birth defects. There's a growing and alarming body of research indicating that GMO foods are unsafe, and absolutely no research whatsoever proving that they are safe. And yet the USDA and FDA continue to approve, and just this past month even agreed to speed up approval of these crops that scientists and physicians increasingly link to poor health. Instead of force-feeding kids lies in bogus activity books, how about having them read some truthful articles? The study Bt Toxin Kills Human Kidney Cells says Bt toxins are not "inert" on human cells, and may indeed be toxic, causing kidney damage and allergies observed in farmers and factory workers handling Bt crops. The article supports previous studies done on rats, showing that animals fed on three strains of GE corn made by Monsanto suffered signs of organ damage after only three months. It is abundantly clear that both GMOs made to be resistant to herbicides (aka "Roundup Ready") and those made to produce insecticides have damaging impacts on the health of mammals who consume them, particularly in the liver and kidneys. We already know that from the trials of 90 days and less. In looking a little deeper into the info, we found a number of issues that point to a probable increased level of toxicity when these foods are consumed over the long term, including likely multi-generational effects. Multi-generational effects. Eating GMO foods harms not only our health, and our kids' health -- but quite possibly their kids, too -- even if we stop eating them today. Existing food systems have failed to address hunger, and at the same time encourage diets that are a source of overweight and obesity that cause even more deaths worldwide than does underweight. A transition towards sustainable diets will succeed only by supporting diverse farming systems that ensure that adequate diets are accessible to all, that simultaneously support the livelihoods of poor farmers and that are ecologically sustainable. Corporate greed plus a complicit government have allowed for the rampant poisoning of our food and environment, and the demise of sustainable agriculture practices -- practices sorely needed if we are going to feed the world's population, and avoid a world health crisis. And we've exported the same misery and destruction to foreign countries far and wide. Propaganda like the CBI's Look Closer at Biotechnology has brainwashed many of our kids into thinking that the biotech industry has people -- not profits -- in its best interests. The book's claims are laughable. But framing blatant lies as "science" for children in schools borders on criminal. For parents and teachers out there, here's an alternate lesson plan. Because world hunger is a concern, because saving our planet does matter, and because better health is a worthy and achievable goal, let's ask our kids to think critically, instead of accepting at face value "information" attractively packaged by multinational corporations. Don M. Huber, emeritus soil scientist of Purdue University puts it in terms everyone, kids included, can understand. Huber talks about a range of key factors involved in plant growth, including sunlight, water, temperature, genetics, and nutrients taken up from the soil. "Any change in any of these factors impacts all the factors," he said. "No one element acts alone, but all are part of a system." "When you change one thing," he said, "everything else in the web of life changes in relationship." This is what we should be teaching the future stewards of our planet. Listed below are links to blogs that reference this entry: Outrageous Lies Monsanto and Friends Are Trying to Pass off to Kids as Science. This page contains a single entry by Toni published on March 27, 2012 4:50 PM. Poland’s Monsanto action lays 1000s of dead bees on Govt steps was the previous entry in this blog. ANH Feature: Medical mavericks and heart disease is the next entry in this blog.